Digital Radio is an application very well suited to HERON products. 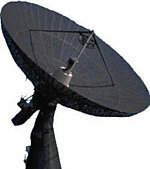 Many companies provide DSP products for the telecommunications industry. HUNT ENGINEERING products provide modularity and flexibility that cannot be found in the standard "telecoms" products. If, however, you are performing standard telecoms functions those products will probably be your first choice. With high-rate (IF) processing performed in FPGA modules and baseband processing in DSP processors, you can build elegant solutions to many communications challenges. We've supplied hardware platforms to projects in wireless and wireline, both in test systems and the final communications devices. In wireline processing, our higher resolution interfaces come into their own, allowing the developer to create custom communications systems over existing copper cables, or to try out new concepts - as in the case of xDSL research. In this instance having FPGA is useful - but the DSP processing may be more valuable. Normally our customers are involved in Digital Radio Receivers. A HERON system for a digital Radio Receiver will typically use a module like the HERON-IO2 or HERON-IO5 to provide fast ADCs and a programmable FPGA that can be used to perform some Digital Down Conversion. The reconfigurable nature of the FPGA means it might operate in a number of modes - perhaps an FFT engine to detect active channels, switching later to several DDCs tuned to the strongest channels. DSPs and/or FPGAs can be used to process the results of the input stage, often adding DSP capabilities with a HERON2 to the FPGA capabilities you already have. The DSPs would usually be fixed point so you would choose C6203. The HERON-FPGA3 or HERON-FPGA4 can be used for additional FPGA based DSP power. If you are making a system for broadcast you might be interested in fast DAC interfaces, such as those on the HERON-IO2 and the HERON-IO5. The modules will be placed onto a HERON module carrier - like the HERON-BASE2 USB 2.0, HEPC9 PCI or HECPCI9 cPCI cards, which can be used connected to or in a PC during development, but can ultimately be used stand alone if you want. You may also require additional interfaces to control other hardware. HERON-BASE2/HEPC9, HERON2-C6203, HERON-IO5. But your needs might be different - take a look at the full range of HERON products and if you need some help with choosing your system configuration please use the enquiry form.